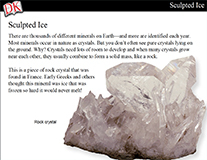 Become an instant expert on rocks and minerals. 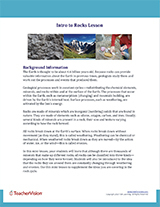 Find motivational mini-lessons and the reference material you need to reinforce key concepts, such as weathering, erosion, types of rocks, and mineral formation. Use this slideshow to provide an introduction to rocks—explaining what they are made of, the three different ways in which they form, and some of the ways in which surface rocks can be broken down. 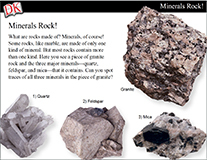 Use this slideshow to introduce different kinds of minerals to students and to explain how some minerals are used. 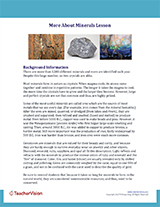 This can be a helpful introduction to minerals, before a unit on properties and identification.